Destroy student debt with our FREE guide that shows you step-by-step exactly what you need to do to earn your degree debt-free! Find out how much college is really going to cost and create a plan to pay for it! The Student Budget Tool is a living document you'll use throughout your college career to make sure your money is on track and you're on the path to a debt-free degree! 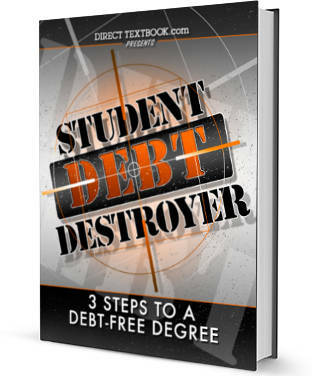 Download Student Debt Destroyer absolutely FREE today! Direct Textbook is on a mission to help students save money on college. Our textbook price comparison engine has already saved millions of students millions of dollars on textbooks. Now, we've created the definitive roadmap to eliminating college debt and securing financial freedom!